The last day at Aragats Summer Camp was a sad day indeed for the kids who had to bid farewell to twenty carefree days spent surrounded by mountains and green forests in one of the most beautiful areas of Armenia. Ani Chalian, supervisor of the Syrian group, vigorously described the jam-packed activities and entertainment in which all 16 children took part. “I feel fortunate to have led the Syrian-Armenian group for the second time and to have engaged them in theater shows, painting, and dances, as many of them were initially shy to interact. Together with the kids, we learned plenty of morning group exercises, exposed new talents, and celebrated birthdays, among other things,” remarked Ani, who pointed out 12-year-old Sevak from Aleppo who spent his birthday at camp. Erik Mkrtchyan, 14, was among the new talents from Goris who transformed white poster board into a piece of art demonstrating his idea of a “Peace Planet,” for nations and folks throughout the world. A CASP beneficiary himself, Erik said that he used his CASP support to buy his school supplies and drawing materials. 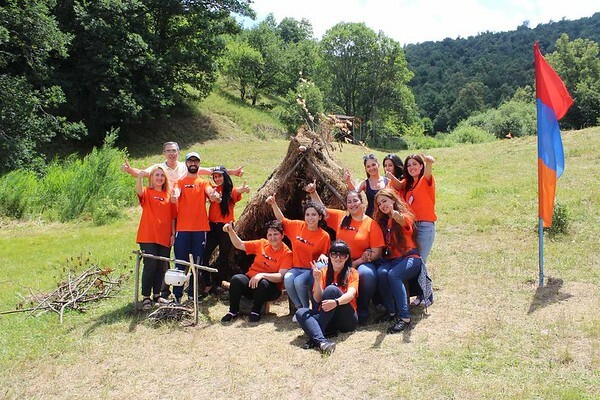 “The camp provided the children with a hands-on curriculum that integrated social interaction, literacy, music and arts, self-confidence, and community building, along with the practice of public speech, recitation, and self-representation,” said Gohar Khachatryan, 21, another group leader and former FAR Gulamerian Scholarship student.